Pelican Parts Forums - G50's and 2step. Who has done it? G50's and 2step. Who has done it? Hi gents long time no speak. 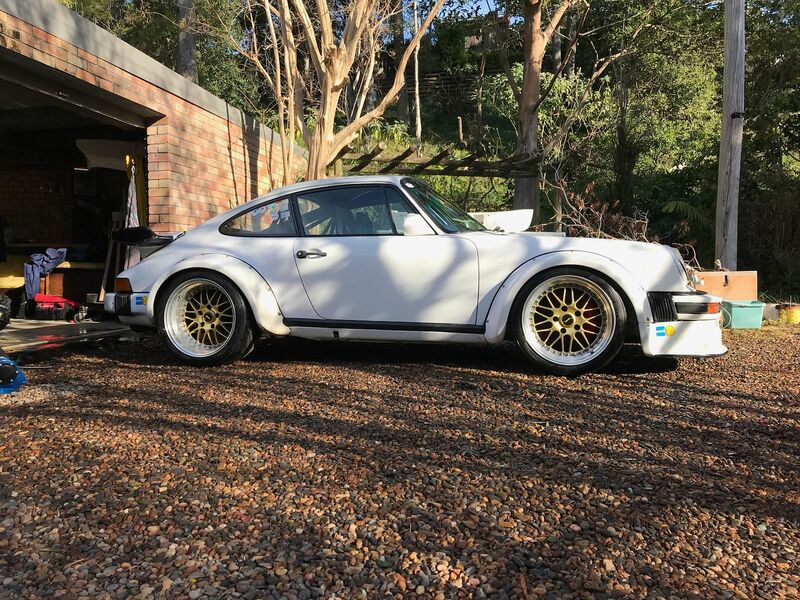 I've been away from Porsches playing with other stuff until a couple of weeks ago when an ex Prosche Cup car fell into my lap at a reasonable price (For these days). Basic specs are 3.4ltr GT3 cranked stroker bottem end, twin plug heads, GT35, E85 with about 1.1bar of boost making about 500USRWHP. Weight is ~2250 pounds. Carbon doors etc pretty much everything but the roof. Anyhoo I'm thinking about setting up some 2 step on the car to help get it off the line. The current button clutch and light weight flywheel mean it pretty much only likes "race starts" IE min 2,500rpm and off the clutch quickly. "Checking things" I've side stepped the clutch at 5,00rpm and it was happy to turn the 295 semi slicks for quite a bit. I'm not sure if the Box is an early '50 with smaller diff yet as I forgot to check this moring before heading off to work. But I do know it has a billet side plate, custom gearset with a 1:1 5th and new very tight LSD. My question: Is anyone running 2step on a 930/911 turbo with a G50? How has it held up? Cool car Uncle, I'm not running 2 step but can you tell me what the very light LSD is? I have a button clutch and lightened flywheel too, does your transmission sound like a box of loose rocks?! I'm thinking of going back to a standard clutch, it's bit much for a street car. I used my 2-step several times on my G50 without a billet diff cover. Launched it many times on 285 street tires in 2nd gear too. 1st just does nothing but spin. Have not used slicks with it on a dragstrip, but will. The car was built in "92 for Porsche Cup in Australia and has competed constantly since then and is still log booked. like all race cars it looks good from 10 feet way but has battle scares up close. It came with 5 full sets of wheels including a set of BBS e50’s to fit the 934 flairs. My plans are to give it a tidy up and make it look like the Brumos 934. I won’t cover over the patina its earnt I’ll just remove the old brackets and the like that’s redundant from the car whilst refitting the air jacks and other stuff. A mate and I run a small race prep shop on the side of our normal jobs so for me its perfect as I love doing that side of stuff. I’ll get some more photos and start a build thread after I get the weekend ½ mile sprint event done and dusted. Nothing too hard on the car but a good chance to give it a shake down. The tight LSD is that its all but a locked diff. Whilst you can turn the wheels independently of each other when you go to do a U-turn it wants to spin the inside wheel. Yes I have the same box of rocks you have. It shifts perfectly and works as it should but it’s along way from a “road car”. OK interesting. We had the car on the dyno last night checking the tune and decided against using the 2step. The tune on the car was pretty average and it looked like they had just ball parked it and done a couple of ramp runs. We picked up close to 50RWHP and over a 150nm of torque with nothing other than the tune. Started off with sorting the low end driveability of the car then did a couple of power runs. There is clearly easy power to be had in a more modern turbo, better intercooler and some bigger injectors but I’m in no rush. I drove it home from the dyno and the difference is night and day. Granted it was a cool night but its massively better to drive and feels a lot more crisp on the throttle. I rolled it on quickly in 2nd on an on ramp only to spin the tyres so fast I bounced off the limiter a couple of times before I had the chance to upshift. so that's a real 934? Eddie Bello ran a G50 when he busted his G64? He has nearly 3 times the power of us. G64 is an AWD gearbox. Eddie had a 50/50 that grenaded and they were so hard to find he built up a regular g50 with my gears, diff, and a sidecover. He was at 1200whp on max boost. It's just a 1977 911 that's pretty pissed off about things. 2 step acts like anti-lag for a turbo car. You retard the timing tremendously (I think I put mine at 30 ATDC! ), and the then cut some many cylinders. In my case, I cut 5 out 6 cylinders from ignition. Only 1 cylinder fires per 2 crank revolutions. This allows you to put the pedal to the metal, and the engine is artificially loaded creating boost while you are not moving. I can hit my max 1.4 bar in a few seconds while the car is stationary. This is a drag racing technique for jack rabbit starts, as everyone likes to say here. Does it hurt the motor in anyway? It probably creates a more uneven head load distribution as the exhaust side gets hotter than normal I’d imagine just like thermal reactors did back in the day. I know my motor had a nice aroma after doing it every time. But, just like giving them the Italian tune-up, it seemed to purr smoother afterwards too. So is it the same as "flat foot shifting"? Yes, after the launch, yes. This keeps the turbo at full boost during shifts like anti-lag. You have to put a switch on your clutch pedal. I have the microsquirt for frankencis and will be using it also for cop in a wasted spark config when the engine goes back in.